The die from an Intel 8742, an 8-bit microcontroller that includes a CPU, 128 bytes of RAM, 2048 bytes of EPROM, and I/O "data" on current chip. A circuit built on a printed circuit board (PCB). Circuits can be constructed of discrete components connected by individual pieces of wire, but today it is much more common to create interconnections by photolithographic techniques on a laminated substrate (a printed circuit board or PCB) and solder the components to these interconnections to create a finished circuit. In an integrated circuit or IC, the components and interconnections are formed on the same substrate, typically a semiconductor such as silicon or (less commonly) gallium arsenide. Analog electronic circuits are those in which current or voltage may vary continuously with time to correspond to the information being represented. 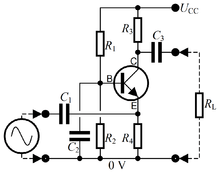 Analog circuitry is constructed from two fundamental building blocks: series and parallel circuits. In a series circuit, the same current passes through a series of components. A string of Christmas lights is a good example of a series circuit: if one goes out, they all do. In a parallel circuit, all the components are connected to the same voltage, and the current divides between the various components according to their resistance. The basic components of analog circuits are wires, resistors, capacitors, inductors, diodes, and transistors. 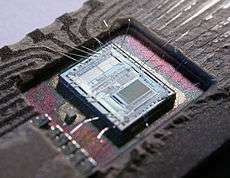 (In 2012 it was demonstrated that memristors can be added to the list of available components.) Analog circuits are very commonly represented in schematic diagrams, in which wires are shown as lines, and each component has a unique symbol. Analog circuit analysis employs Kirchhoff's circuit laws: all the currents at a node (a place where wires meet), and the voltage around a closed loop of wires is 0. Wires are usually treated as ideal zero-voltage interconnections; any resistance or reactance is captured by explicitly adding a parasitic element, such as a discrete resistor or inductor. Active components such as transistors are often treated as controlled current or voltage sources: for example, a field-effect transistor can be modeled as a current source from the source to the drain, with the current controlled by the gate-source voltage. When the circuit size is comparable to a wavelength of the relevant signal frequency, a more sophisticated approach must be used. Wires are treated as transmission lines, with (hopefully) constant characteristic impedance, and the impedances at the start and end determine transmitted and reflected waves on the line. Such considerations typically become important for circuit boards at frequencies above a GHz; integrated circuits are smaller and can be treated as lumped elements for frequencies less than 10GHz or so. The design process for digital circuits is fundamentally different from the process for analog circuits. Each logic gate regenerates the binary signal, so the designer need not account for distortion, gain control, offset voltages, and other concerns faced in an analog design. As a consequence, extremely complex digital circuits, with billions of logic elements integrated on a single silicon chip, can be fabricated at low cost. Such digital integrated circuits are ubiquitous in modern electronic devices, such as calculators, mobile phone handsets, and computers. As digital circuits become more complex, issues of time delay, logic races, power dissipation, non-ideal switching, on-chip and inter-chip loading, and leakage currents, become limitations to the density, speed and performance. Digital circuitry is used to create general purpose computing chips, such as microprocessors, and custom-designed logic circuits, known as application-specific integrated circuit (ASICs). 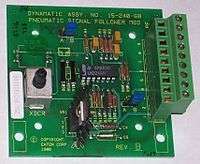 Field-programmable gate arrays (FPGAs), chips with logic circuitry whose configuration can be modified after fabrication, are also widely used in prototyping and development. Mixed-signal or hybrid circuits contain elements of both analog and digital circuits. Examples include comparators, timers, phase-locked loops, analog-to-digital converters, and digital-to-analog converters. Most modern radio and communications circuitry uses mixed signal circuits. For example, in a receiver, analog circuitry is used to amplify and frequency-convert signals so that they reach a suitable state to be converted into digital values, after which further signal processing can be performed in the digital domain. ↑ Charles Alexander and Matthew Sadiku (2004). "Fundamentals of Electric Circuits". McGraw-Hill. ↑ Richard Jaeger (1997). "Microelectronic Circuit Design". McGraw-Hill. ↑ John Hayes (1993). "Introduction to Digital Logic Design". Addison Wesley. Wikimedia Commons has media related to Electronic circuits.